Facebook has imposed a 30-day suspension on Alex Jones - founder of the InfoWars conspiracy theory site. "We reviewed the content against our community standards and determined that it violates [them]," Facebook told tech news site CNet. InfoWars has not yet responded to Facebook's action. 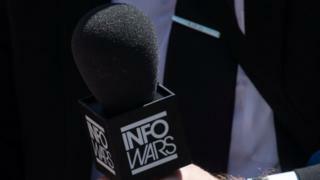 As well as taking down the videos, the InfoWars YouTube channel has been hit by a penalty known as a "community strike", which stops it broadcasting live for 90 days. More than 2.4 million people subscribe to Mr Jones's channel on YouTube.